When I was in college - quiet times came easy, time seemed to be abundant and I read my Bible through cover-to-cover several, several times...now that I'm a mom...finding that time to read daily is sometimes a struggle. Last year, Brad & I started reading a read-through-in-a-year plan in January, and did great until April...or was it June...and then we fell behind and never caught back up. I don't even remember what really happened, except that we were typically reading at night and life just got busy. This year, I knew I wanted one of my goals to be to get back on track with my Bible reading, I just didn't know what plan could/would best make that happen. I read a little here and there and then back at the end of January I found BibleShared. I was immediately excited as blog accountability seems to work for me! I immediately signed up and started reading. I love that I can read the Bible in any order I want and simply record my progress as I go (last week I was reading in Humility and Mahaney referenced Habakkuk, so I stopped and quickly read those 3 chapters to better grasp the his point - I didn't have to wait for the summertime to roll around for Habakkuk to come up in my yearly reading plan.) I can read while online or I can read offline and record my progress after the fact. I also love that they have a widget I can put in my sidebar so that anybody can see how I'm doing - that motivates me. As a mom of 2, it's often difficult to find time to sit down and read my Bible for 15 minutes (or more) at a time...however I'm on my computer all day long. Using Firefox, I simply keep my BibleShared page up in a separate tab, and periodically throughout the day I pop over to it and read a chapter or 2. Wow - what a difference that has made! In only 18 days of using their service, I've already read 90 chapters - or 7% of the Bible. Yippee!! 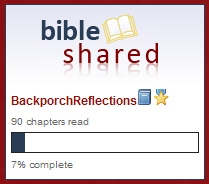 And, on my progress page, BibleShared tells me that if I continue to read at my current rate of 5 chapters/day, I'll finish the Bible in 219.8 days. That's really exciting for me, because it tells me that I can finish the Bible this year! 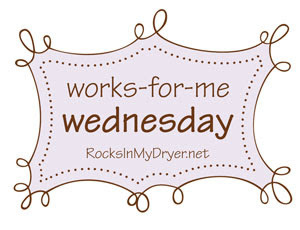 If you want more great WFMW ideas, head on over and see Shannon @ RocksinmyDryer - and head's up...this is Shannon's last week hosting before she passes the torch on over to Kristen! Enjoy!